Although Wakefield is a bit outside our usual stomping ground, last week I had an appointment there and decided to do lunch beforehand. Not sure where to eat, I shook the Twitter Magic Eight Ball to see what would come up. 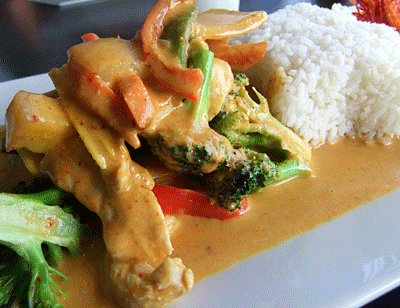 Several people suggested Red Sugar Café, a Thai place that has only been open a few months, and I took the hint. A friend who works in Lynnfield met me at the small storefront, and we were seated at one of the eight tables and given a steaming mug of tea to warm us as we perused the menu. All of Red Sugar’s prices are very reasonable, but their lunches are particularly so, accompanied by seaweed soup, an appetizer, and steamed rice. I chose the chicken mango curry with gyoza as the starter ($8). The small, tender dumplings were savory and excellent, and the ginger dipping sauce was divine. The curry was beautiful, with lots of crisp-tender veggies, including red pepper and broccoli, in addition to the chunks of chicken and tangy mango. The sauce was hot and lush but not overwhelming. It was one of those meals I couldn’t stop eating, even though half of it would have been sufficient; it was just too delicious. 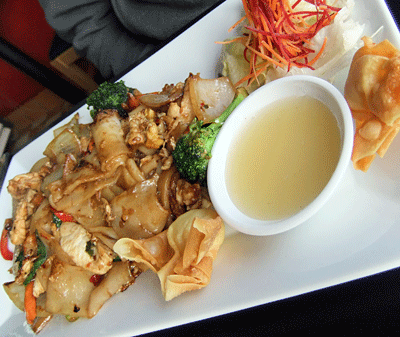 My companion opted for the drunken noodle dish and the Thai crab rangoon appetizer ($9). The rangoons were tasty, and the sweet apple dipping sauce was unusual. The hefty portion of pan-fried wide noodles mixed with chicken veggies and basil leaves was another winner—spicy and satisfying. It is clear that the lunch menu just scratches the surface of what Red Sugar offers, and a return for dinner is in order to experience the full range of dishes. Given the great prices, exceptional service, and delicious food, Red Sugar should be on everyone’s must-try list.